“Brian is in the kitchen,” said the Frenchman as soon as he heard my name. Which was puzzling, because I wasn’t in the kitchen. I was outside in the garden having a pre-dinner drink. “What do you mean by that?” I asked him. I’d been baffled by this phrase once before in France and this was my chance to get to the bottom of it. “You do not know?” He seemed surprised. This time I laughed too. The mystery was solved, and now I feel quite proud that my unfashionable English first name has such a memorable place in French culture. That’s not the only thing I learned during a summer holiday on the Île de Ré, a small island halfway down the west coast of France. I also found that the car I’d hired at La Rochelle airport was barely needed. The island is so flat and compact that nearly everyone gets about on bicycles. Everywhere you look there are people on two wheels… young people, old people, whole families towing the smallest children in buggies. They whizz along wide cycle paths by the side of every road. They zoom between vineyards on cross-country tracks away from the traffic. And when two tracks cross, everyone grinds to a halt in a two-wheeled traffic jam. Ten years ago the Île de Ré was all but unknown territory for British tourists. But during nine days at the height of the season last year, it seemed that every fourth cyclist we passed was a Brit. If you rent a holiday home it’s likely to have several bikes you can use. Otherwise there are lots of hire options, including Cyclo-Surf, with seven locations and a website in English (www.cyclo-surf.com). Weekly rentals start from £25. If you do without a car, as well as having an extra few hundred quid to spend, you’ll also save the steep £14-per-vehicle fee to cross the elegant two-mile bridge from the mainland. Locals have successfully campaigned to keep this toll in place even after the bridge debt is paid off this year. They’re desperate to avoid a flood of day-trippers and the “wrong sort of people” who might come swarming across a free crossing. It’s just a tiny bit posh, the Île de Ré, and they hope to keep it that way. When Paris empties every August a fair proportion of its doctors, lawyers, politicians, actors and TV presenters can be found here, and it’s been compared more than once to the well-heeled resort of Rock in North Cornwall. Yet there are few signs of ostentatious wealth and no snobbery that I could detect. Cars tend to be practical estates, not show-off 4x4s. Everyone pads around in old T-shirts and floppy shorts rather than designer labels. And the wide sandy beaches are full of ordinary French families too, often three or four generations on holiday together. There a slogan which says the Île de Ré is “a Mediterranean island lost in the Atlantic”. You see it everywhere, on T-shirts, posters, mugs and cushions in both French and English. And that’s exactly what it feels like. More often than not the island’s summer goes by in an endless succession of cloudless blues skies. It gets as much sunshine as the Côte d’Azur but you don’t get that baking southern heat that leaves you worn out and frazzled by the end of the day. There are excellent beaches all the way round and the south coast is one continuous wide strand. Our favourite stretch was the Plage de Pas Des Boeufs south of the village of Le Bois. There are enough places of interest to visit before or after the beach too. The capital, Saint-Martin, a UNESCO World Heritage site, is one of the world’s best-preserved fortified ports. Its 17th Century ramparts form a perfect star-shape when seen from the air. The harbour’s elegantly weathered buildings house lots of quirky little shops as well as bars and restaurants. 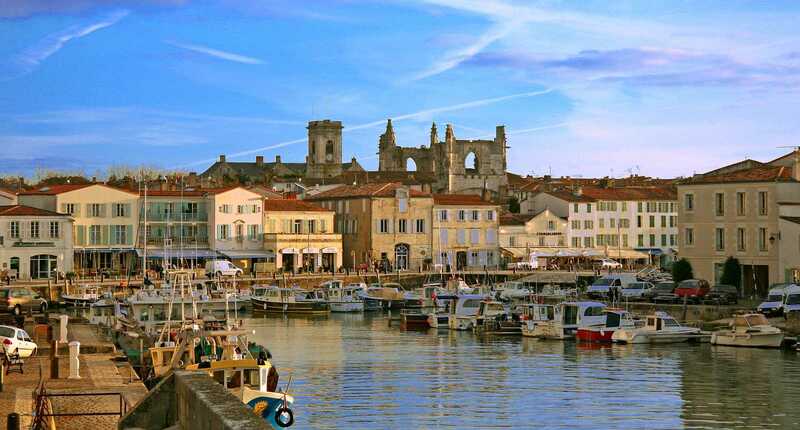 The same applies to the smaller port of La Flotte to the east… but be sure to go there in the morning to visit the medieval food market in its walled enclosure. All of these places were within easy cycling distance of our base at Sainte-Marie-de-Ré. The car was left unused on four days of our stay, but we did drive to the end of the island to visit the Phare des Baleines (lighthouse of the whales) on the western tip. 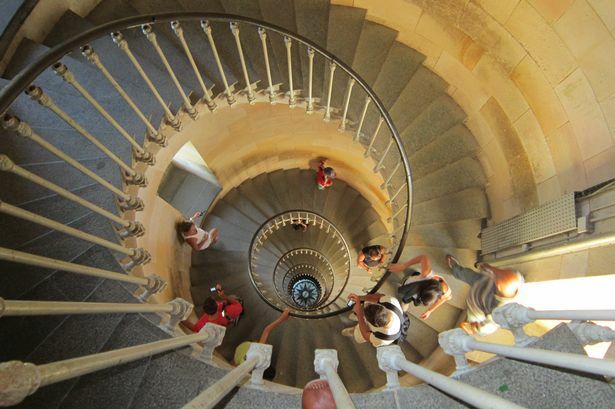 Built in 1682, it has a spectacular spiral staircase (257 steps) that looks like a snail shell when viewed from the above or below. From the top you can seethe neighbouring islands of Aix and Oléron and Atlantic fortress of Fort Boyard, setting for a series of game shows shown on UK TV. I was lucky enough to be invited to a French couple’s holiday home along with an ever-changing line-up of their extended family and friends. Dinner outside in the evening was such an enjoyable part of the experience that we ate out only once. But you don’t need any special French connections to come here. Go online to find a self-catering cottage, villa or campsite and you’ll find prices are much the same as the rest of France. La Rochelle airport is less than a mile from the bridge and in summer there are buses every 15 minutes. Get lucky with the transfer and you can be on the beach an hour after your plane lands. Holiday home: English-owned house with pool sleeping six in La Flotte from £700 per week in mid-June to £1,550 in early August. Go to www.holiday-rentals.co.uk and enter the Property Code 74885. Campsites: six-to-eight berth mobile homes average £300 per week in low season to £800 in high season. Find one in the Places to Stay section at www.holidays-iledere.co.uk, the island’s excellent official website full of info aimed at British holidaymakers. Lots of airlines fly direct to La Rochelle from Gatwick, Stansted, Southampton, Bristol, Birmingham, Manchester, Leeds, Glasgow and Edinburgh. An edited version of this article appeared in the Homes & Holidays section of the Sunday Mirror on May 27, 2012.